And here begins perhaps a few cosmetic appearance type changes to try and separate my car from the rest of the vintage red 3rd gen RX-7s. I typically don't go in for these type of things but they were relatively inexpense and I thought I'd indulge myself a little. 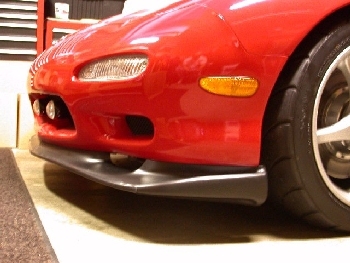 The first is the 1999 front lip spoiler. 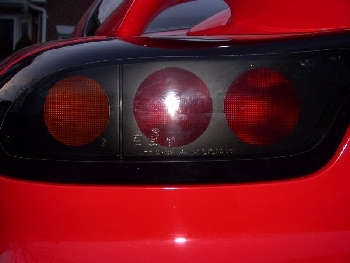 Both sides of the spoiler "assembly" can be purchased for about $160. Subtract from this cost the money from sale of my old R1 spoiler and the out of pocket cost is minimal. The '99 spoiler does in fact have some mild performance benefit as it apparently is more effective at funneling air up and around the side of the car rather than under the nose. Thereby reducing front end lift at high speed. It should help with mild understeer during those high speed kinks such as that found on the straight at VIR when passing by the start finish line. I have yet to test the theory in actual application but from an engineering perspective it certainly looks this way and what Mazda advertises it as. The before and after pictures clearly show a much more aggressive lip between the old and the new. So how did the installation go? It was easy in principle is all I can say. The bolt holes and pins in the section between the brake ducts lined up perfectly. Not so much can be said for the outer portion. It was close but not quite. 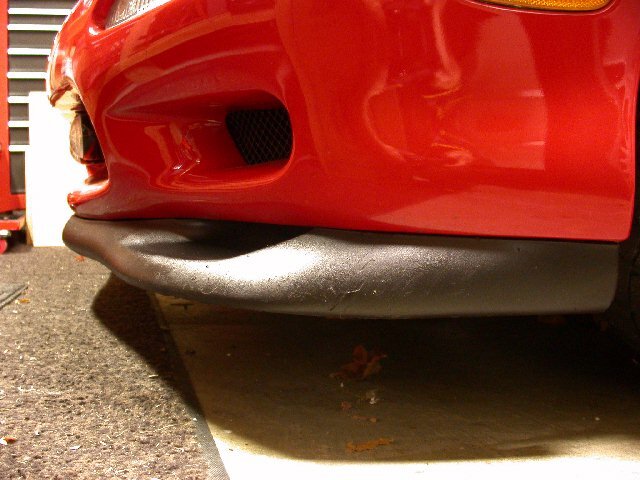 The issue is that the lip spoiler is designed to fit with the 1999 bumper which is, of course different. The holes and pins do not align so some jockying is needed. How much of a perfectionist you are dictates how much jockying of the spoiler you decide to do. In reality the side "wings" of the 1999 spoiler are longer than the R1 lip spoiler. So you have to make a choice, does it jut more forward or sit more reward. 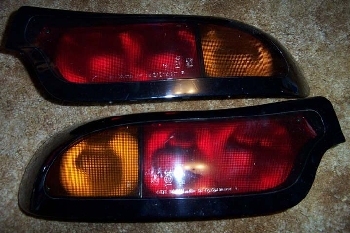 I chose the more rearward location as can be seen in the pictures below. In either case new holes in the bumper must be drilled to accommodate the '99 spoiler. This, with a bit of pulling a stretching between the bumper and spoiler will get them to follow the same profile and the fit will look pretty good. Only one issue remains that might concern some, but for now I'm going to let it go, is that now the brake ducting inder the car no longer aligns. A small to insignificant detail that I might attempt to remedy sometime in the future. This really serves no purpose other than to make my car different. I'll be the first to admit this. However, it was inexpensive and really does look nice. During the course of a repair resulting from an offtrack mishap on one of my friend vehicles he noted that his replacement lens had a circular imprint on the inner surface. Yet the lense reflector itself was in the traditional US spec shape. 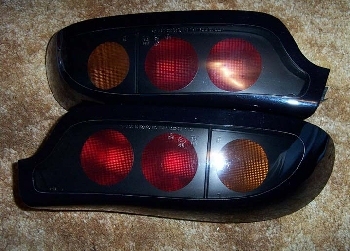 We surmised that Mazda did nothing new to the lens housing itself for the 1999 lights but merely painted or applied a shield to give the circular openings and light pattern. This turned out to be exactly the case.